You are currently selecting tickets for the 18/05/2019 (2:00pm - 3:00pm) Highlights - From Your Favourite Musicals. This event has multiple dates or times.If you wish to change to a different event, please select a date, then a time before selecting tickets. Come and enjoy a marvellous night of Musical Theatre. 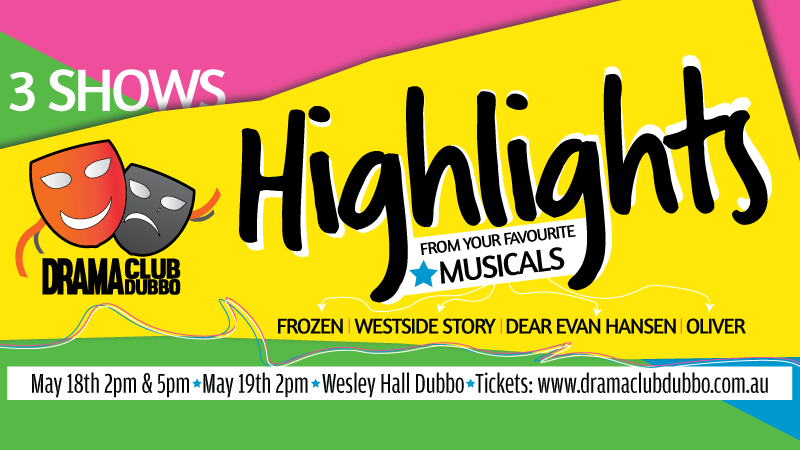 Drama Club Dubbo students, between the ages of 3 and 21 will bring you songs and scenes from musicals such as Oliver, Frozen, West side Story and Dear Evan Hansen. Prepare to be dazzled with stunning costumes, sets and wowed with Dubbo’s talented young performers. Three shows only, tickets will sell fast so don’t delay, come support these young Dubbo stars.